This year’s Memorial Day Parade Grand Marshal will be Darien resident Pat Parlette, and the speaker at the day’s annual ceremony will be Matt Pavia, a Darien High School teacher and author, the Darien Monuments and Ceremonies Commission has announced. The commission also announced that organizations and groups participating or wishing to participate in the parade on May 27 need to update their contact information with the commission. Pat Parlette, now in her 90s is a longtime town resident who has been an active volunteer in several town organizations. She’s also no stranger to Darien events involving veterans. 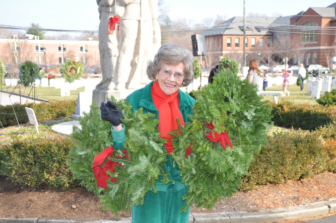 Pat Parlette has helped place wreaths at veterans grave sites during the annual Wreaths Across America event for many years. In 1943, as the first girl drum major in the Darien High School band, she was part of the band’s salute to departing World War II recruits at Darien railroad station. When she graduated from Darien High School, she got a scholarship from funds raised at the Darien Community Association Thrift Shop, where she later volunteered for many years. 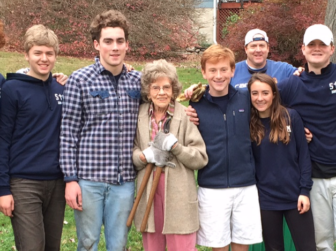 Pat Parlette, center, with At Home In Darien leaf-raking volunteers helping her with her lawn. 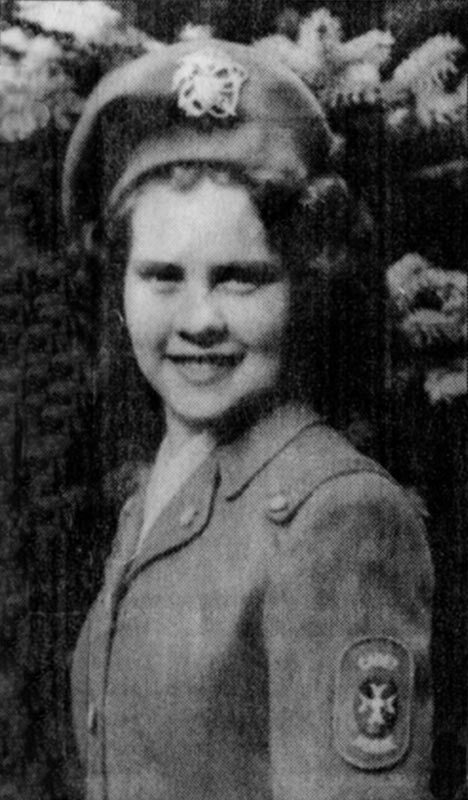 She joined the U.S. Cadet Nurse Corps in 1943 and was trained in helping polio victims on iron lungs. She trained as a nurse, graduating from Greenwich Hospital’s nursing education program in 1946, then cared for polio patients at the Tripler Military Hospital in Hawaii. Parlette worked for Seaboard World Airlines as a nurse/flight attendant, helping get troops home to the United States. Matt Pavia has taught American Studies and English at Darien High School for 16 years. 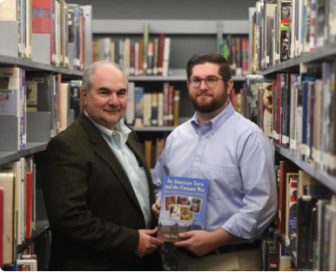 With his father, Tony Pavia, he is co-author of An American Town and the Vietnam War, about the men and women from Stamford who served in the Vietnam War, and their families at home, who worried about them. Chairman David Polett will once again serve as master of ceremonies for the event immediately after the Parade at the monument in Spring Grove Veterans Cemetery. This year’s Parade will be held on Monday, May 27, 2019 stepping off at 10 a.m. with the annual United States Air Force flyover along the Post Road (weather permitting) occurring at approximately 10:30 a.m. The commission needs organizations and groups that want to participate in the parade to send in the organization’s name, current contact name of the person who will handle communications, this person’s email, mailing address and phone number. Please send this information to 06820mayparade@gmail.com by April 8, 2019. M&C Commission Vice Chairman Terry Gaffney has volunteered to run this year’s Parade. Thank you in advance for your cooperation in sending this vital information. Updating your contacts will ensure that your organization is included in all mailings and notifications. — information from an announcement from the Monuments and Ceremonies Commission, the Seaboard World Airlines former employees website and a previous Darienite.com article.